Firefighters spray water through a window to battle a fire at the home of the Riley family at Black Oak. The home and its contents were destroyed. – Dennis Brown Photo. Firefighters were called to a home at Black Oak late Monday when a mobile home there was reported on fire. 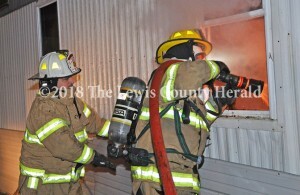 Firefighters from Black Oak, Lewis County, Garrison, and Firebrick fire departments responded to the call at about 10:30 p.m. Monday at the home of Jeremy and Tami Chaney Riley on Ky. Rt. 8. The mobile home and its contents were destroyed by the fire. 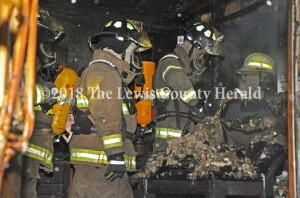 Although family members were home at the time the fire began, no injuries were reported. Assisting at the scene were Portsmouth Ambulance, Lewis County Sheriff’s Department, and Vanceburg Electric Plant Board. The Riley family includes three children: a 10-year-old girl, an 11-year-old boy, and an 18-year-old boy. Contributions for the family may be left with Vanceburg Christian Church. For information call the church at 606-796-2431. Traffic on Ky. Rt. 8 at the scene was disrupted for a short time to accommodate first responder vehicles. Firefighters were on the scene for about two hours.